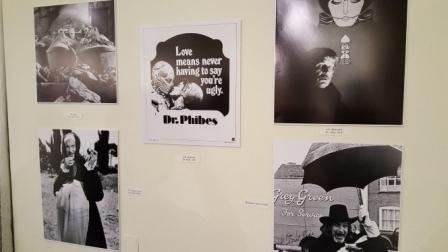 Vincent Price gallery at Creature Features. 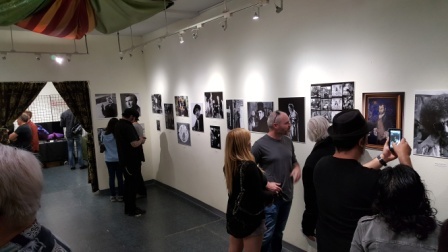 Photos of exhibit taken by Robert Kerr. 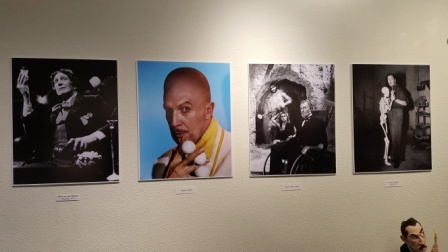 By John King Tarpinian: This weekend Creature Features in Burbank, California hosted a photo gallery retrospective of the career of Vincent Price from the David Del Valle archives. 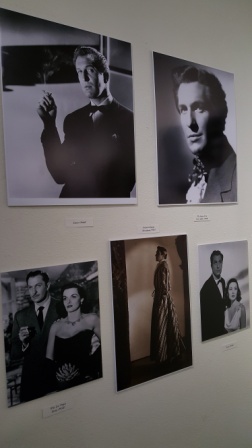 Lovely black-and-white photos of the man that gave us so much pleasure over the decades. I have my own Vincent Price story. While in high school and college I worked at the Los Angeles Zoo. Mr. Price was a zoo patron and visited the zoo frequently. When he wished to be left along he would leave his hair at home and be wearing a Hawaiian shirt, Bermuda shorts, hard black shoes with black socks and garters. People would either look away or totally ignore the funnily dressed older gentleman. And as long as he did not speak nobody would be the wiser. All the photos are by Robert Kerr. 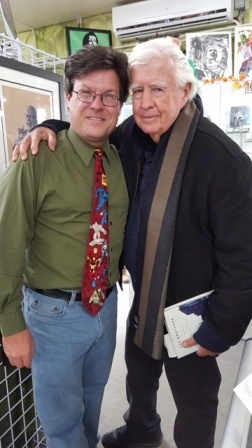 The white haired gentleman is Clu Gulager, best known for his role in The Virginian TV series. 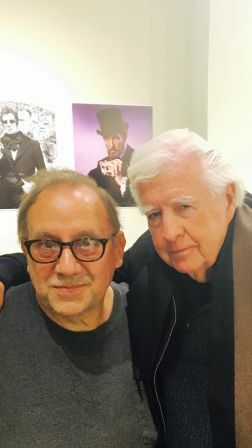 Robert Kerr and Clu Gulager. Vincent Price was fond of reminding his fans that “If you limit your interests, you limit your life.” In a career that spanned nearly six decades, Vincent Price made films in nearly every genre. 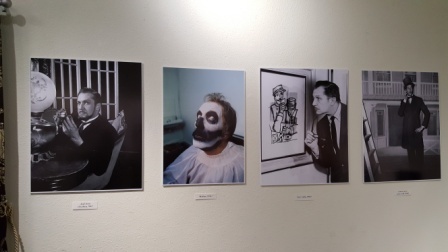 However, it was the horror genre that made him an icon – especially in the turbulent 60s, with the youth market ready to cross boundaries in every aspect of life and art. In the 50s, Price was already well on his way to becoming the heir to stars such as Boris Karloff with films like House of Wax and The Fly. The showmanship of William Castle presented Vincent as the elegant host of the House on Haunted Hill, and then allowed him to reveal The Tingler — shocking teenagers senseless as they were electrified with buzzers hidden beneath their theater seats. A young director named Roger Corman did the rest, creating eight films based on the works of Edgar Allan Poe. 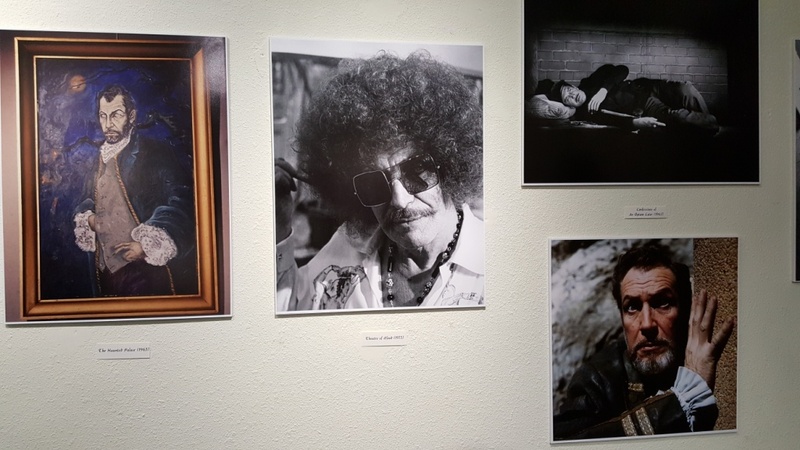 The Poe Cycle presented the Gothic master of horror persona that would remain with Vincent Price for the rest of his life. The Importance of Being Vincent is an exhibit of the finest Price images to be offered anywhere. 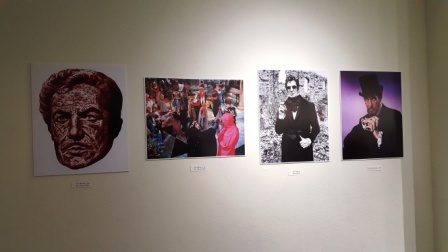 It represents my favorite actor in the world, showcasing every aspect of his career in show business. 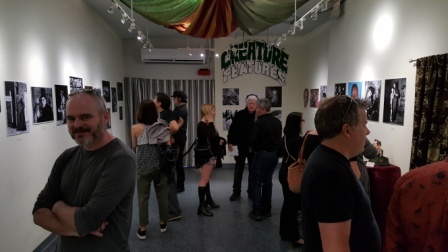 For the rest of the month, the exhibition will be available for viewing during regular hours at the Creatures Features store, 11a.m. to 6 p.m. Wednesday through Saturday, and 11a.m. to 4 p.m. on Sunday; closed Mondays and Tuesdays. John King Tarpinian and Clu Gulager. This entry was posted in Like Show Business and tagged Creature Features, John King Tarpinian, Robert Kerr, Vincent Price by Mike Glyer. Bookmark the permalink. Being a New Englander growing up, I didn’t have a Vincent Price story except by proxy. Someone in NESFA, maybe Tony Lewis, stumbled across a dedicated Price fan somewhere in the area, and this man had created a massive omage to Dr. Vibe. He was someone just a few years older then I, and he’d sunk god only knows how much money into building what he’d built, and I think he’d reached out to Price, who had seen it or visited it, and loved what he’d seen. Maybe Morris Keesan has some dim memory of who this was, or even when it was (pre-1979, when I was already in Minnesota). Price’s work in the horror film genre tends to overshadow his other accomplishments and interests. He was an accomplished cook (demonstrating on the Tonight Show how to poach fish in the dishwasher) and an art collector and advocate for public accessibility to art. He also worked occasionally in other media than film. Hilde and I attended a performance in the late 1970’s of Delights and Diversions, a one-man stage play where he portrayed Oscar Wilde to remarkable effect. The picture above showing a color photo of Price as Batman villain Egghead also shows, just to the left, his appearance as Wilde onstage.